My astrology friends tell me that Venus is retrograde until 15th April. What does that mean to us mere mortals, struggling through life? The planets going retrograde or backwards is well-known. We can tell when Mercury is going backwards, we’re hit with technological issues or people just don’t listen. With Venus, it’s a little more complicated I think. Venus is the brightest star in the sky, after The Sun. She hangs around with the Moon & is often known as the Morning Star or the Evening Star, depending on when she comes to “hang out”. During a Venus retrograde, lots of things suddenly feel off. Your head might feel it’s about to explode, dreams may be off & wonky. What you wish for may not manifest right now & what you value may change drastically during a Venus Retrograde. 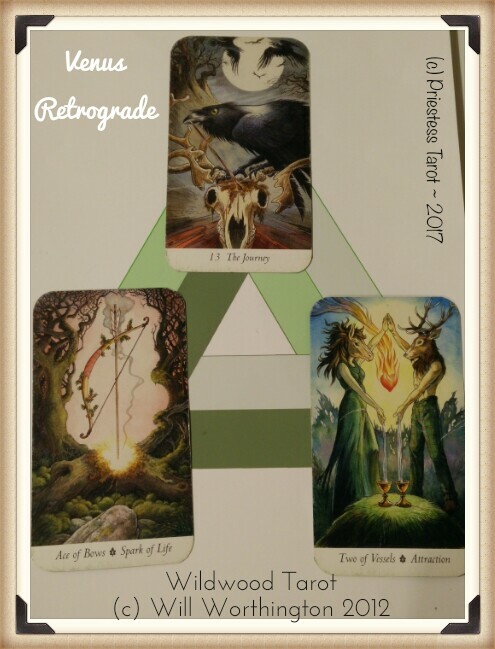 I asked the Wildwood how best to proceed during this Venus Retrograde, including the show parts from January until May 18th, even though Venus is direct from April 15th. It was my birthday on the 7th of March, which is when I heard about it. Here are the answers. The value of change is the value I need to embrace during this Venus retrograde. You know what? There’s positive change & negative change & the negative change that’s happened, I wish would just undo itself & sod the hell off. It’s unlikely to happen though but I should, apparently, embrace the change, the reducing, the reusing & the recycling of things. Nothing stays the same, everything changes but nothing is forgotten; nothing is ever forgotten. What do I need to dream now that will manifest in April? Well, knowing that we’ve a shadow pull to come I’d say it’s more like mid-May before we’ll see dreams manifesting. However, the dreams for me involve me following or creating my passions. I need to find & create the spark that will move me forward. I have an idea on what that is & it’s a hint (more of a bow) to my life path number of 33. This makes me smile; keep being me! It’s hard when you’re tired a lot of the time (A side effect of Venus being Rx) and having to deal with people who frankly, need to just go away again. I doubt that’s going to happen, so the best thing I can do is to keep an emotional balance for me & mine & connect on the levels that are best for me. I know what they are, I know what that means for those that are around me, for those that matter to me. I’ve enjoyed this little soiree into the realms of Venus Retrograde with me & The Wildwood. Buckle up, Mercury Retrograde is joining in too & I think I might just hide in the house & stay there until May 18th!